We are so excited to share our New Designs with You! All our pattern designs are hand drawn by SR. 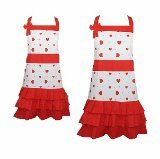 This collection features lots of frills and bows and our first Men's and Boy's Aprons. We now offer Family Apron Sets - to suit your family size and gender!